Cloudburst Moorland Seafoam from Firespiral Slings is a blend of 55% cotton, 30% linen and 15% viscose. It weighs 263 GSM making it a medium weight wrap. Cloudburst Moorland is woven using Firespiral's Alchemy Weave, which is slightly looser and makes for lovely soft & mouldable wraps. Until recently I just didn’t get yellow, particularly mustard yellow, and this preference wasn’t restricted to snow! I naturally gravitated towards blues, teal, turquoise and purple... and then I saw Tarn Moorland Starmap. This beautiful wrap forced me to look at the variegated mustard Moorland wrap differently and I’m now a huge fan. My colour palette was long overdue an injection of something new and the Firespiral ladies nailed it with their sassy, classy, take on yellow. Having found my love of Moorland, I turned my eye back to earlier releases on the warp in case I unjustly overlooked anything, and found the enigmatic Cloudburst Moorland Seafoam. There wasn’t much spam of it about and it seemed to look a little different in every set of pictures I saw. I was desperate to see it in person and thrilled when Firespiral let me test and review it. The Cloudburst weft is a beautiful, rich blue with amazing depth of colour. Sometimes the light catches it revealing an almost electric blue. In low light it takes on a moodier grey-blue colour. Teamed with Moorland it makes a classic, wearable colourway with the beautiful, organic Seafoam design providing two distinctly different faces. 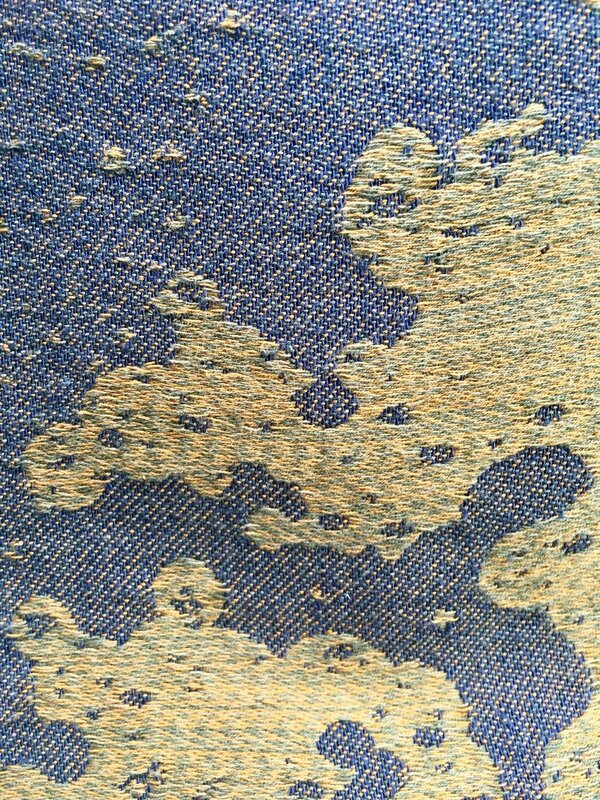 Moorland looks like gold leaf against the regal Cloudburst blue. In hand, Cloudburst Moorland feels light, floppy and fairly thin. It has quite a bit of diagonal stretch and a fine texture on the blue, Cloudburst face. As you’d expect from Firespiral Alchemy, the cotton Moorland warp is silky soft, and the Seafoam design provides its usual texture at the lower portion of the wrap. Cloudburst Moorland wraps easily and ties a neat, secure knot. It wraps generously and I managed to eeek out base size carries in a base -1. I’ve been lucky enough to try and review several of Firespiral’s cotton / viscose / linen blends including Cloudburst Cascade Seafoam and SETI Cascade Starmap. All are floppy, with a beautiful drape and soft from the outset. The 30% linen content adds the strength you might expect from the fibre, without making the wrap particularly prone to creasing or hard to break in. All in all, the blend makes for mouldable yet supportive wraps and Cloudburst Moorland is no exception. The differences in the wrapping qualities of these three tri-blend Alchemy weave wraps lies largely in their weight. At 305 GSM, SETI is the thickest of the three and tops the charts in terms of strength, support and cush. Cloudburst Cascade is 250 GSM and is the thinnest, most mouldable and squish-worthy wrap of the three. At 263 GSM, Cloudburst Moorland sits in between them and for many people will be the perfect Goldilocks Baby Bear wrap. It’s a versatile medium weight that can be used from newborn but has enough strength to carry a toddler. Like Cloudburst Cascade, Cloudburst Moorland has a fair amount of stretch so you’ll probably want something a little longer to facilitate multi-layer carries if you plan on lugging around a heavy wrappee for any distance. Having said that (afraid of slipping and falling backwards - there is precedent! 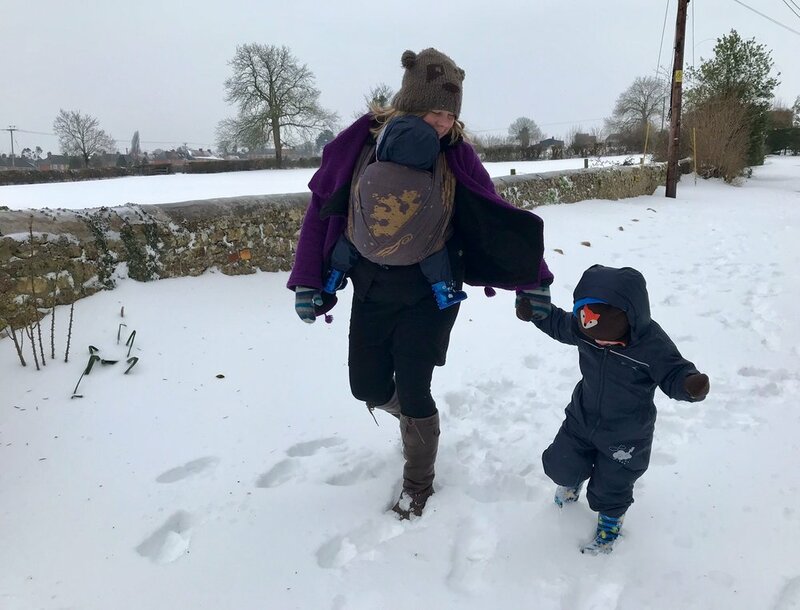 ), I carried my one year old comfortably on my front in a FWCC in the snow. 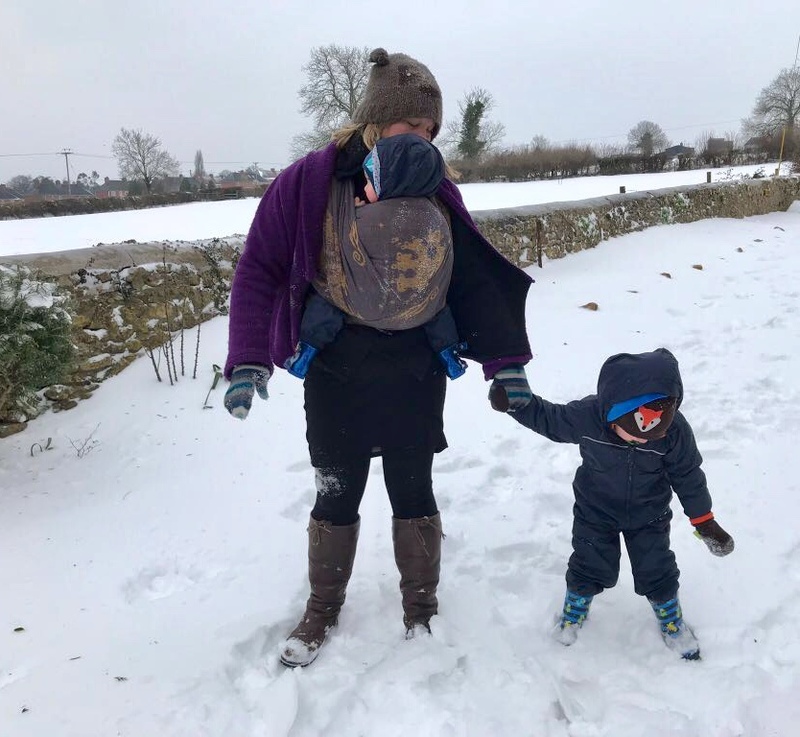 We didn’t cover any distance, but his big brother took a good couple of hours to fully explore his first snow before wet mittens finally got the better of Scott of the Antarctic. Cloudburst Moorland added a couple of welcome layers in the recent sub zero temperatures but it’s a beautifully cool, breathable wrap that’ll be ideal for spring and summer too. It’s machine washable and very easy care. Cloudburst Moorland Seafoam is a stunning wrap and an ideal medium weight all-rounder for all seasons. It’s eminently squish worthy, yet most definitely has enough strength to carry your little one as they grow into toddlerhood. Cloudburst Moorland Seafoam is available to buy from the Firespiral Slings website. I recommend following them on Facebook for all their news and details of upcoming releases. Feb 6 Firespiral Tarn Moorland Starmap - FLASH REVIEW!